Description: An elaborate chandelier designed with a dramatic look, the Sycamore tree is a symbol of protection, eternity and strength which represents Egyptian goddesses to the tallest trees in New York City. 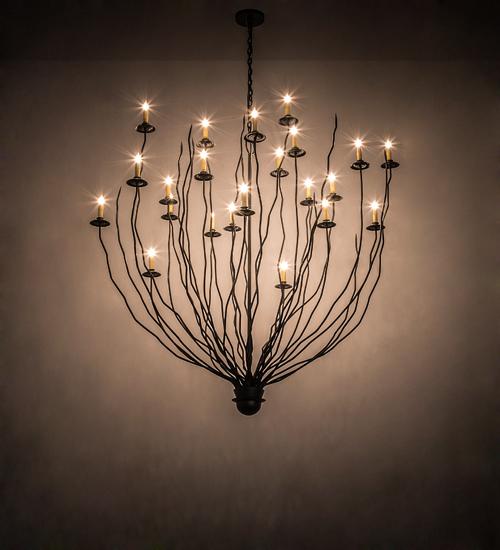 Organically fashioned metal branches finished in Flat Black appear to grow in various directions like those from natural trees, including 22 arms that embrace Amber faux candlelights perched on bobeches for beautiful ambient illumination. This nature inspired fixture is handcrafted by highly skilled artisans in Upstate NY at the foothills of the spectacular Adirondack Mountains. Dimmable energy efficient lamping options and custom sizes, styles and colors are available. The 54-inch wide fixture is UL and cUL listed for damp and dry locations.